Educational Qualification : Must passed 8th Standard from any recognized institute/Board. Age Limit : 18 to 37 years maximum for General, 5 years of relaxation in age for SC/ST. Educational Qualification : Must passed 5th Standard from any recognized institute/Board. How to Apply – Eligible candidates fill application form on prescribed format and send to “Sectary, Punjab Legislative Assembly, Chandigarh along with their educational qualification certificates, Category Certificates and Demand Draft. We will checking the updates, please visit every hour for more updates. I need peon job. pls help me. I belong Batala Punjab . my qualifications is 10th, ±2 . Religion SC. 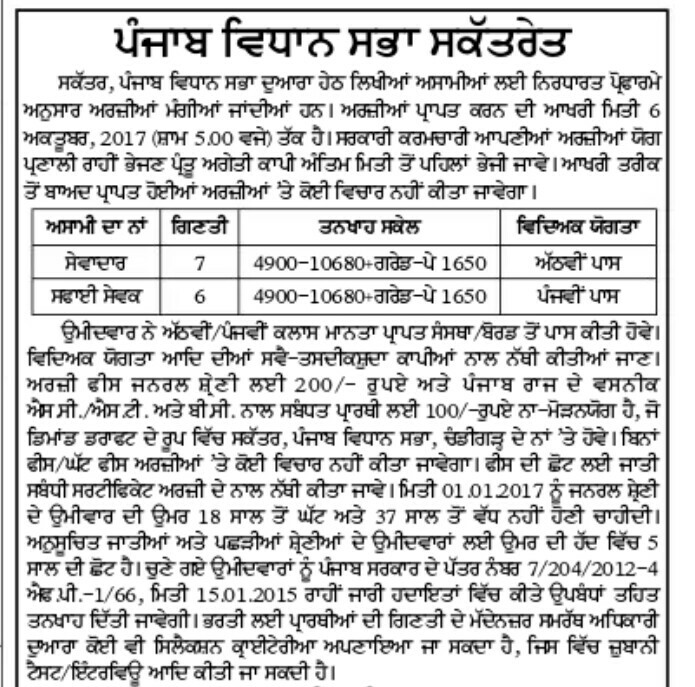 Please send me form of Punjab Vidhan Sabha requirement of post.